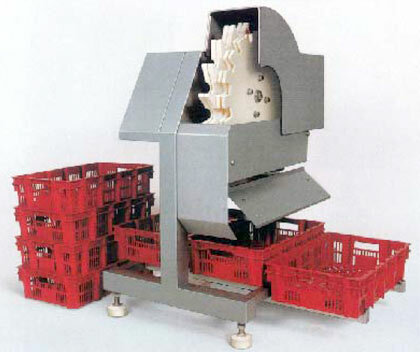 The Whole Wing Portioner optimally meets the requirements of modern slaughtering plants. The equipment offers problem free operation, precision and reliability. Its working method is definitely economical. The wings are placed into a rotating wheel. They are then guided over fixed knives which, according to the settings, cut the wings into two or three pieces. The wing portions are directly cut in the joint. The equipment is space saving and can be set up at any location. When designing the equipment, great importance has been attached to the safety, reliability and durability. The wing portioner is primarily made of stainless metal and synthetic material. Careful tuning of the components guarantees the high quality of finished product.